The Upright Fruiting Offshoot (UFO) was developed by Dr. Matt Whiting (Washington State University in Prosser). 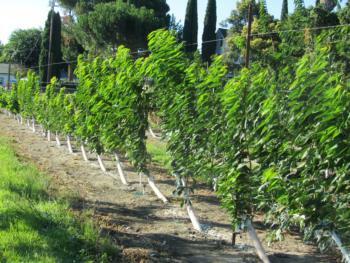 With a between-row spacing of ten feet, the height of the trees should be no more than nine feet. 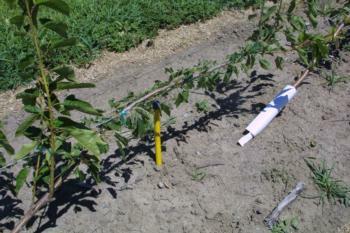 Four 12-gauge wires are used on the trellis. The bottom wire is 2 feet above the ground, and the remaining wires are 2 feet apart. We found that an additional wire is needed between the first and second wires for tying new shoots so they don't flop over. 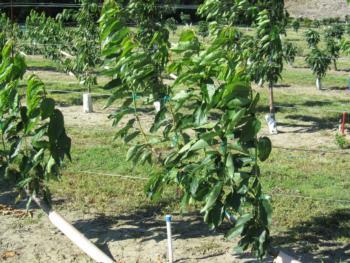 Trees are planted at about a 45-60 degree angle from vertical, with the trunk laid horizontal along the lower trellis wire. Buds on the underside of the trunk are rubbed off, and some are removed on the upper side of the trunk, leaving well-spaced buds that will form the upright shoots. Each branch is treated like an individual tree. Spurs are produced on each upright, forming a fruiting wall. Pinch excessively vigorous uprights (generally those closer to the root system) in late spring/summer. All lateral branches are removed. Fruit production on the lower third of uprights should start in year 2. After a few years (starting in 3rd dormant season after planting), cut back about one or two of the thickest upright branches to three or four buds and direct a new shoot upward to renew the branch. 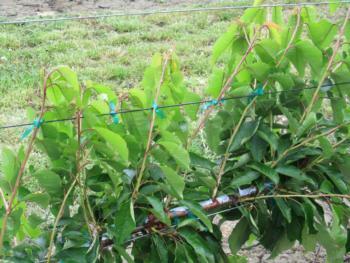 Therefore, the upright branches and spurs are kept rejuvenated to maintain large fruit size. As mentioned in the introduction, UFO trees were planted in February 2010 and because of non-uniform bud push and the insufficient number of shoots, all 1-year-old branches were removed in early 2011. Uniform shoot growth should be possible in year one in order to reduce the time to first bearing. However, removing branches at the beginning of year two does provide strong and uniform growth, such that total yields over the first few years are probably not much different and the upright branches are fully filled in. UFO trees beginning their growth (before tying down to wire), late April 2010. Non-uniform shoot growth of UFO trees, July 2010. New growth in April 2011 after all branches from 2010 were removed. Tree protectors were cut to fit and placed over the trunk to stop rabbit damage. 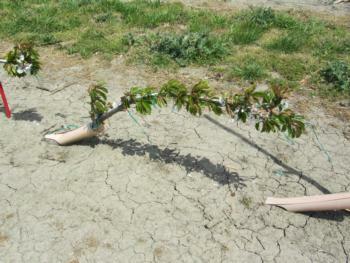 Far more shoots grew in 2011 as a result of removing the shoots that grew in 2010. Notice that an extra wire (twine used here) was helpful at 3 feet, between the first and second wires, to keep shoots upright. UFO tree on Gi12, June 2011. 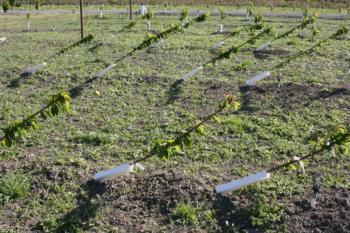 These trees were headed too short in the nursery, leading to fewer upright shoots. Relative size of UFO trees, August 2011. Two trees on right are Gi5; next four trees to the left are Gi12; next four trees are Gi3 (small); next four trees are Gi6.